In 1904, a man named Raphael Manitz, died in the New Providence Asylum. His death notice appeared in the 15th., October 1904 newspaper. Manitz had a wife, Lucy Munroe Manitz, a daughter, Olivia Isabelle Manitz (born 31 May 1886 Nassau, Bahamas) and a son William Charles C. Manitz (born 02 October 1887). Raphael Manitz’s death notice is unusual for a number of reasons. First, Raphael Manitz was a Nurse. This was quite extraordinary, as the history of the nursing profession is commonly thought to be dominated by women. For the Bahamas to have one, of what may have been only a small number of male nurses during the late 1800s, is incredible. Second, Raphael Manitz had been a Nurse at the New Providence Asylum for 27 years prior to his death. Manitz had just retired the year before according to his death notice. 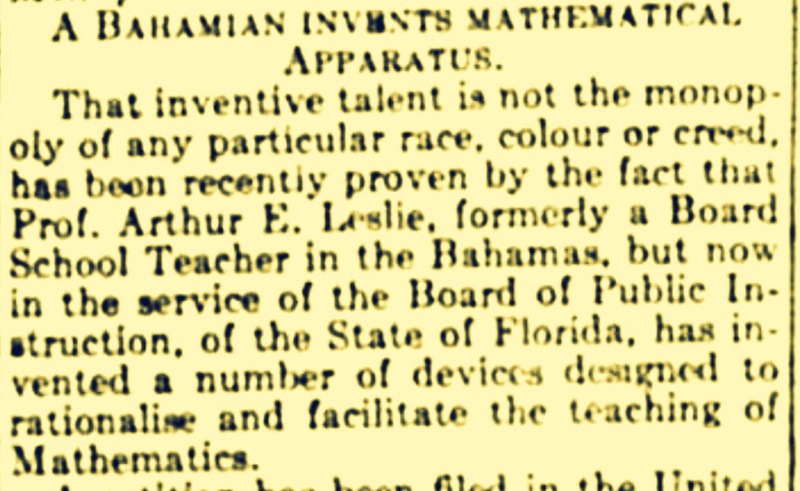 This would mean that he began his nursing career in Nassau around 1876. Third, Raphael Manitz was, according to the death notice, a native of China. Again this is extraordinary to find a medical professional from China, resident and working in that field in the Bahamas in the late 1800s. Fourth, Raphael Manitz is a name far removed from traditional Chinese names. Perhaps it can be inferred that, Manitz may have been one of the Chinese nationals who came to the Bahamas via Cuba in the late 1800s. It may be possible that he had changed his name prior to emigrating to Nassau. Fifth, Raphael Manitz died from complications from a relatively strait forward surgery to treat a carbuncle, a collection of boils. Manitz went to the only hospital on the island, in the same Asylum that he had worked in, for almost thirty years. Manitz had what is commonly called today, an abscess. Modern medicine would drain it and prescribe a strong course of antibiotics. Unfortunately for Manitz, and many others of that time, antibiotics wouldn’t be discovered until 1928, some twenty four years after he died. MR. RAPHAEL MANITZ, A native of China and who for 27 years was associated with the New Providence Asylum as a nurse, having only retired last year, we regret to announce died yesterday afternoon from the effects of a carbuncle for which she underwent treatment in the Asylum last Saturday. Mr. Manitz has left a widow and family and have our sympathy in their sudden affliction. The funeral took place this afternoon.